Bring the spectacle look of the Greatest Show on Earth direct to your birthday party… our vintage circus and carnival performers’ skills are just as amazing as their talent in working with large groups of children…. Meet Amy, the All American Clown! Our gloriously bright and vintage circus party packages are the #1 choice for your next “Greatest Showman,” “Dumbo,” circus, or carnival themed birthday party or community event! 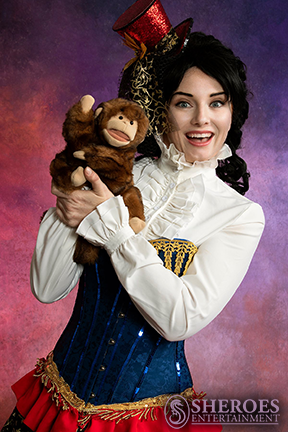 Amy is a vintage circus performer straight out of your child's dream's of the Greatest Show on Earth and is a character exclusively available at Sheroes Entertainment. Amy and her legendary arch-nemesis Fred, The Soon To Be Fried Chicken, comes from the golden age of circus in New York City where circus giant PT Barnum put America on the global map for having the most lavish, over the top, and extraordinary live action performers in the world! 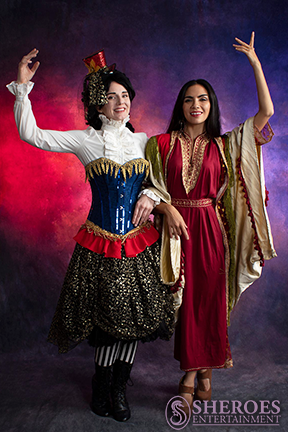 Amy and her spectacular clown, ringmaster, and circus friends are all ready to make your party "come alive" with all the glitter, shimmer, trim, and lavishness that you love from the circus! Photos courtesy of Crystal Olguin and Suzanne Gonzalez. 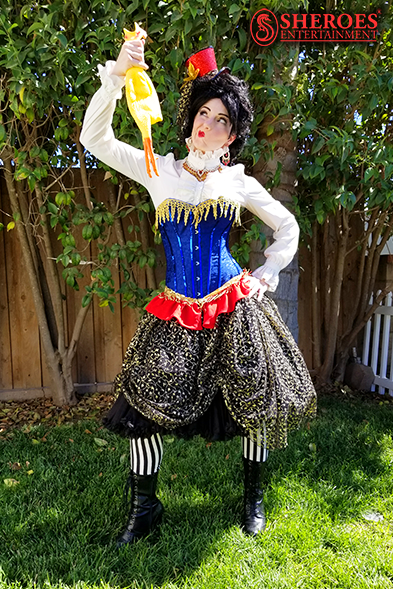 Our clowns and Greatest Showman vintage inspired circus party characters in Los Angeles and Ventura County come with natural face makeup unless white face clown makeup is expressly requested. They are experts at fun who take over the action of your party to channel the group's energy into lively games, whimical activities, and wonderous tales of circus adventure! Approximately (2) main activities plus photos and singing the happy birthday song can be done in (1) hour for every 15 children per (1) performer. If we have more time we'll fill it with games. A rainbow of colors and fun appeal to older kids and teens with this variety pack of circus inspired games and physical challenges for up to 24 kids. Time can be split between either “station format” learning encounters or group games from the following lists (or focus on one area). This option is our top choice for large community events, 1st birthdays, team builders, and classic birthday parties as we can add on additional circus games leads to accommodate larger groups. Plate spinning, juggling “flower” sticks, ribbon wand play, poi spinning from New Zealand, bucket stilt walking, jumping skip toys, scarf free movement and dance, and hula hoop exercises. Relay races, egg and spoon races, rubber chicken chucking contests, and “tightrope” tug-of-war, sack races, leaky bucket races, and wet & soggy sponge tosses. “Rewrite the Stars” Rainbow Glitter & Gem Makeovers are Fast, Beautiful, and Colorful! Are you having a Dr. Suess or blacklight party? Our black and white clowns are perfect!